Fudge Rippled (artificially flavored) Reduced Fat Vanilla Ice Cream in a Sugar Taco Cone with Milk Chocolate (flavored) Coating & Peanuts. Actually I find it a little funny that they use reduced fat ice cream then say "this is not a reduced fat food". Oh well, guess it's all about balance. Now, let's see what it really looks like. Hmmm, they may have embellished that photo just a smidge. It's hard to tell from this angle, but if you turn the taco to the side, it's pretty much a 1/2 thick rectangle. Plus the package makes it look like the whole thing is coated in chocolate, and obviously it is not. Lastly, the peanuts are much smaller and less numerous (not necessarily a bad thing). So how does my $2 gas station treat taste? It's not bad. Since I first heard about choco tacos, I've been meaning to try one, and you should to, even if it's only a one time thing. The fudge is cheap, and I certainly wouldn't call it a ripple. The taco has ok crunchiness (though, this could be the gas stations fault). All together, it's a decent taste, though I figured I would love it more considering the potential crunch factor (ice cream to crunch ratio). Oh well, I'm glad I tried it, but next time I'll get something else. On Second Scoop: I finally went back and tried another Choco Taco. It was disgustingly chewy. I refuse to give Klondike any more of my money on this disappointing creation. Were you looking for the new Chocolate Choco Taco? See the review here. i agree. everyone should try em once but then after that they'll inevitably choose something else. plus they just sound cool. 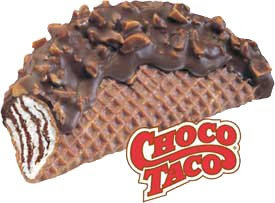 choco taco. just saying it is fun. try. OMG Choco Tacos are like the best dessert food I have ever had! I am trying to find proof of the very rare cookies and cream choco taco! It sounds great and I would love to try it! Try em once then rush out and buy the best. A Nutty Buddy. These don't even come close to the original ice cream, waffle cone, chocolate, and nut frozen confection. Sorry I just wasn't impressed. Pretty good product but a perfect example of false/scam advertising. The bar inside does NOT look like the bar on the box. 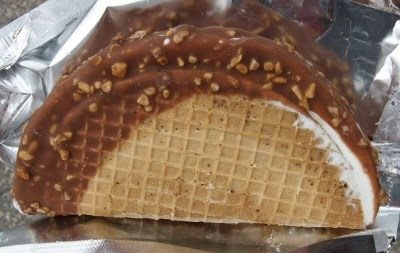 They really skimp on the peanuts with some peanut "dust" and the layers of fudge is only a single layer inside the taco shell. Don't buy it while looking at the box. Only after the photo above. I worked at Taco Bell for 11 years and we sold the AWESOME original Choco Taco AND the Strawberry Choco Taco AND the life-changing, orgasmic Cookies -n- Cream Choco Taco!!! I miss the good ole days!! !